GET YOUR OWN TRADING ROOM OR FOREX SIGNALS APP! Trading4Pro provides you a front-end cross-platform solution: trading room feature is available on web, mobile (adaptive) and apps. Besides, our development team is here to help you to create any kind of branding/customization. Google translation API and notifications service by PushWoosh (mobile apps) are integrated into this product for better user experience and higher retention rate. Our trading room allows you to publish any kind of trading content, from text messages to technical analysis/trading ideas, displayed on chart. The product can be used as an addition to your web resource as well as customized into stand alone branded product, including apps in both stores. The main feature about this product – is that you might have two different feeds: “for all” – which means that just about everybody, who enters your website/app, will get it and “subscribers only” – which means that only users that logged in with unique username and password, provided by you – will see it. 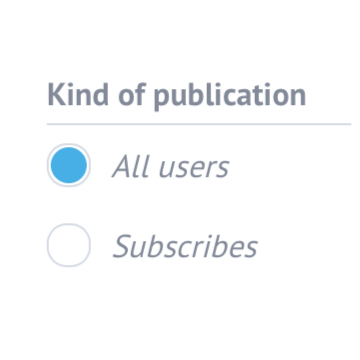 Besides, every user of “subscriber” type can also publish to himself for personal use. 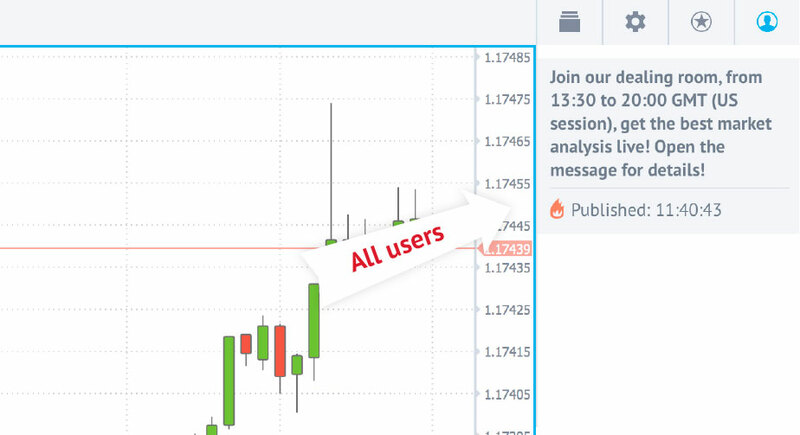 Insert the following username / password on Trading4Pro chart: demo@trading4pro.com / test123 and log in. You will immediately see, that there are more pieces of content than it was when you were unlogged. 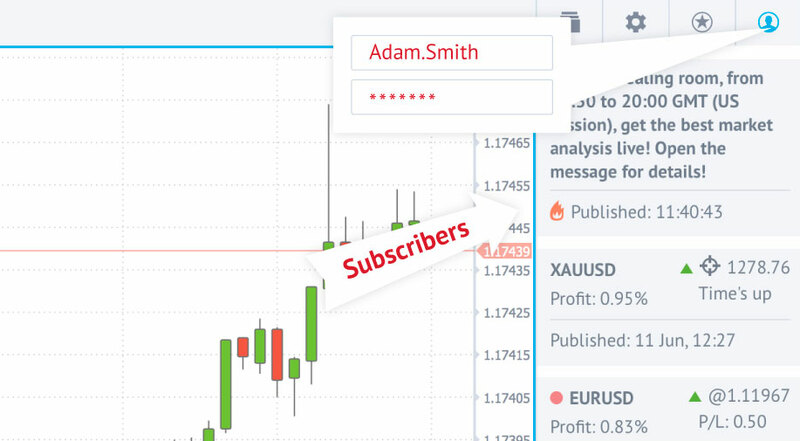 These are the “subscribers only” pieces of content, meaning you can easily use “Trading Room” product for forex signals or any other kind of paid content. HOW I CAN PUBLISH A TRADING IDEA OR TEXT MESSAGE? As soon as you’ve logged in as publishing admin, you’ll get two options: publishing a text message or publishing a trading idea. For text message you'll get a form with a basic text editing tools and "high priority" option - for urgent announcements. 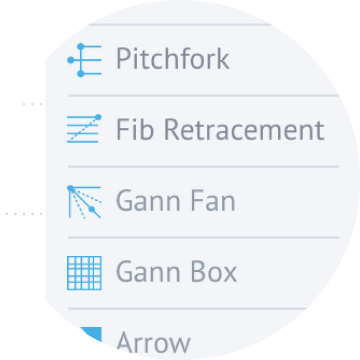 For publishing a trading idea type of message, first you should create it on chart, using our "analytics tools" . 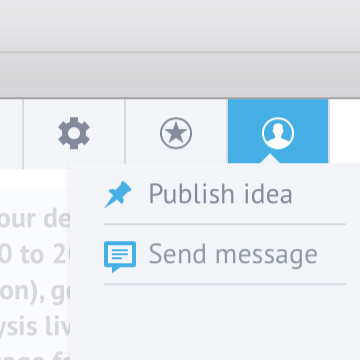 After finishing your technical analysis, go to “Publish Idea” in menu and send it to your users. Regardless of your post type, you’ll have the next choice: either you’ll publish your content to “all user” or to subscribers. In first case it will be available to anybody, who enters your resource, as in second case only users that possess username and password will see your post. HOW I CAN ADD SUBSCRIBERS? 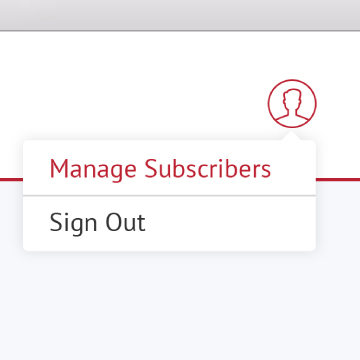 As soon as you've logged in as admin on home page — you can choose an option "Manage Subscribers", that will open your subscribers management panel. There you may add a new user or delete existing, change user’s password or its expiration date and add a comment. Subscribers’ management panel is easy to operate and is very intuitive; You’ll never get stuck here! Also, for safety of your users’ details, you DON’T have to enter user’s mail, just any combination of min. 7 symbols.